After all, that’s why my website says “I’m so good all day and then I binge” right on the front page. I’ve been there, countless times, and I know you probably have been too. We start our day off with the best of intentions, we eat a healthy breakfast, power through our day, maybe hit the candy jar at 3pm (don’t worry, I’ll address this one in a post soon), but we keep muscling through the day. Then we get home….we made it! We got through the day without totally losing it and now we’re gonna go home and eat that healthy dinner we have planned. We walk through the door, barely have a chance to throw down our bag, and then the kitchen cabinets start calling our name. No! I swore I wouldn’t do this. And then we feel like sh*t. What’s wrong with me? First of all, there is absolutely nothing wrong with you. There is a really good reason this is happening, and all we need to do is understand why it’s happening and learn new methods for meeting your needs. 1. Something to do daily: Commit to 15 minutes of transition time. Most of us aren’t good at transitions or change. It throws off our nervous system and we get rattled. We aren’t sure what to do with ourselves or how to calmly and peacefully transition into a new part of our day (or even life). That’s why it’s common to turn to food when we walk in the door going from work mode to home mode, or when we get home from traveling, or when our plans get cancelled and we are forced to adjust. 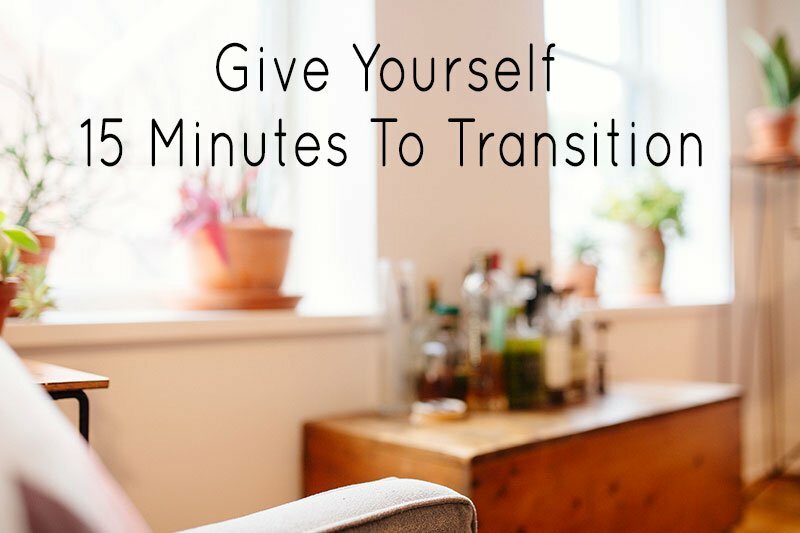 It’s important to first recognize that you’re “in transition” and that it’s natural to need a little bit of time to adjust and get back to that level of calm and equilibrium. I recommend setting a timer for 10 or 15 minutes when you walk through the door and tell yourself “I can eat after the timer goes off if I really want to, but for now I am giving myself the gift of allowing myself to adjust, switch modes and calm down”. During those 15 minutes, let yourself transition peacefully. Some ideas: Put down your bag, take a hot shower, get into comfortable clothes, light a candle, do a few stretches, spend 2 minutes cleaning up so that your environment looks nice, take the dogs for a walk, put on some calming music. 2. 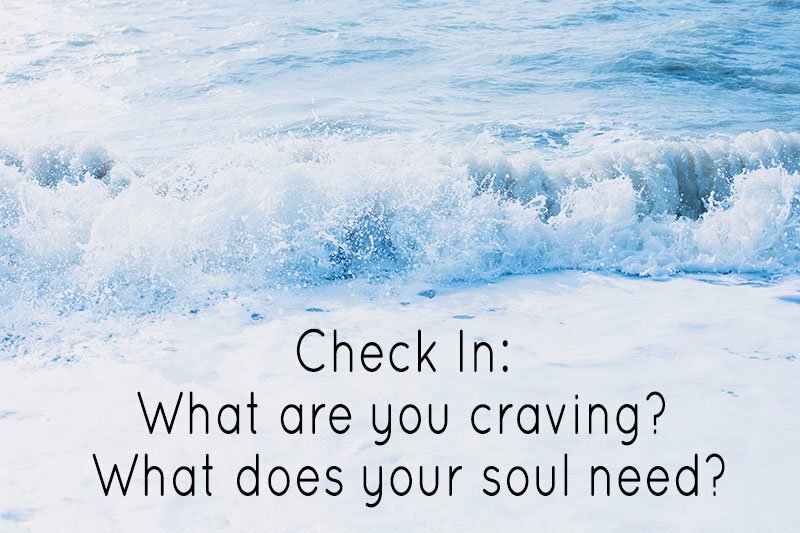 Something to do weekly: Explore your soulful cravings. One of my clients was telling me that she starts to get anxious toward the end of her work day because she knows she’s going home to an empty apartment and she’s not sure what to do with herself and her time at night. 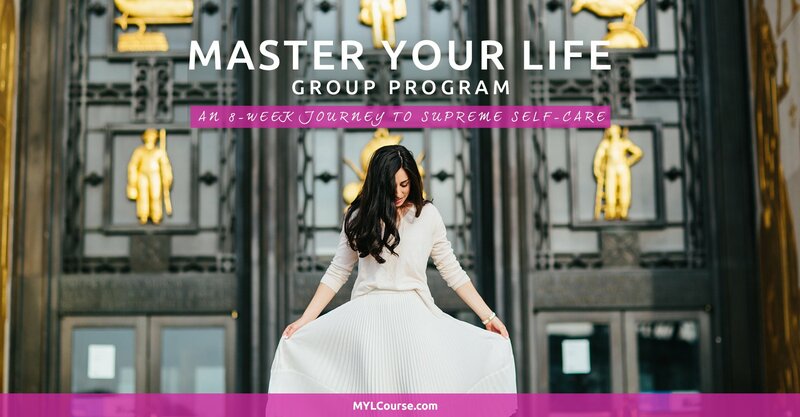 I am HUGE on designing your life so of course I started working with her on designing her weeknights to feel fun, exciting and nourishing. Now, this is an art in and of itself and it takes time, trial and error and a sense of self to know how to design your week to suit you, specifically. Everyone has their own idea of fun and how they like to spend their time, so you need to consider where you’re at. What am I craving in my life right now? Do I feel like I need tons of social interaction right now or do I feel burnt out and like I need solo time? Do I want to hang out with women? Men? Or do I want to date or spend more time with my partner? Is my soul craving one-on-one time with a best friend or to go out and have fun in a group setting? Does my body need home cooked meals this week? If so, how many would feel good? How much rest do I need this week? What kind of rest do I want? Do I feel like I need physical activity? What kind would feel energizing and nourishing? Do I need time to slow down and go inward? Time for reflection? Am I itching for a creative project? Something inspiring and new? As we go through life which is constantly changing, we will always need different things. It’s really important to stay in tune with how you’re changing week to week and what you’re craving as you move through changing seasons, work schedules, and even your own cycle. Also, don’t worry if these questions leave you feeling like “um I have no effing clue!”… this is a practice of getting to know yourself that will take time to cultivate. 3. 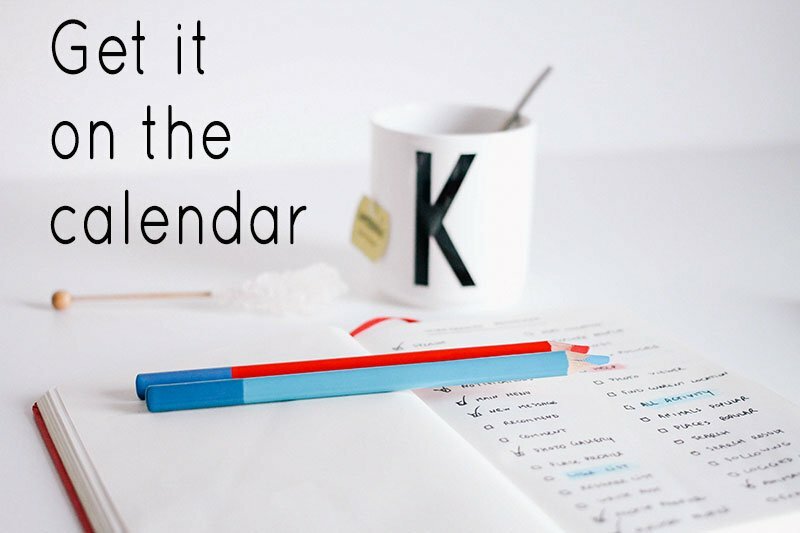 Something to do weekly: Whip out that calendar. Ok so now that you have a sense for what you’re craving for the week, it’s time to whip our your trusty calendar. Based on what you came up with in Step 2, start intuitively planning out your week. Maybe you discovered that out of 5 “weeknights” (Sun – Thurs), it would feel nourishing to spend 2 of them alone and 3 of them out and about with people. 1. Going out on a weeknight doesn’t need to mean getting drunk at a bar. If that’s not your thing, don’t do it! Invite a friend to go to a spin class and dinner instead. 2. See what’s happening in your city — try to push yourself slightly outside your comfort zone every once in a while to meet new people and go to new events. 3. Being with people also doesn’t need to be out — invite some people over to watch a show (Bachelor party? ), or have a casual brunch date or dinner party at your place. Do what feels good to you. 4. I’ll repeat this again because it’s really important: Don’t wait for plans to fall in your lap. Trust that people do want to hang out with you, and start being the driver of your life by creating plans. Okay so I want to hear it, guys. How are you going to make your week next week awesome? How is it going to be MORE appealing than cookies? In the comments below, let me know what your plan is for next week! Let’s inspire each other with creative ideas and hold each other accountable for doing our best to enjoy each day. And be sure to follow me on Instagram if you aren’t already — I’ll be posting about my weeknights next week to help give you some more inspiration! P.S. I have posted something similar in the past that you might find useful on this same topic. Find it here. P.P.S. There are lots of new people in the Intuitive Eating Challenge, so if you’re looking for a great community to support you in creating a “normal” relationship with food, now would be a great time to join the IE Challenge. Click here to start today! Yes! Taking that time makes a world of a difference. Awesome job, Ivana! xo. 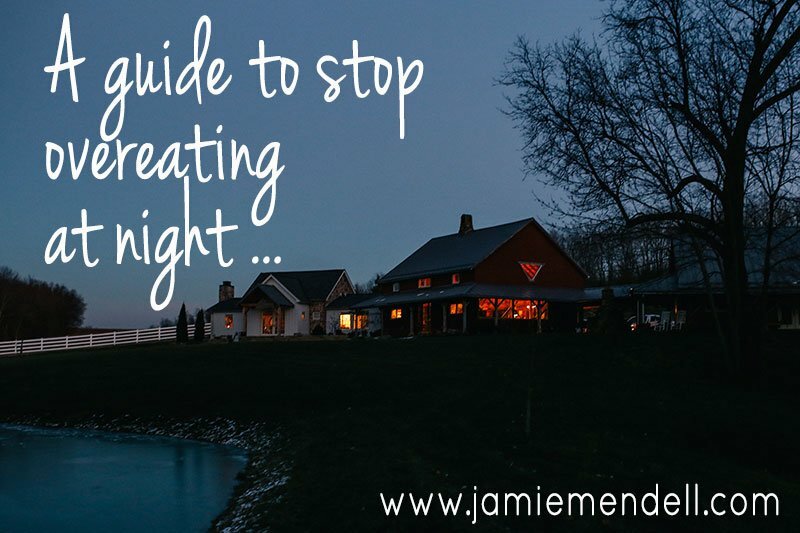 Jamie, I really appreciate how applicable and action-oriented these steps are! This is something I’ve really been struggling with this winter since it’s been so consistently cold and snowy where I live and everyone is hunkered down and also starting to feel the cabin fever! Ah I hear you Megan… the winter is really tough and we just have to get a little extra creative. Stay warm darlin! xo. Hi Jamie, thank you so much for posting this. Every single thing that you have said (in all your posts and this one) have felt so real and genuine, because I have had the exact same experience as you. Your advice has really broken down my problems and made me view then as a treatable issue. I am so so grateful for everything you say, and you are so inspiring to me. My struggles with food and self image are so deep rooted that I have experienced so often the sense of hopelessness and despondency that makes me want to give up every single day, but your words motivate me once again. This transitions time post has made me look at my problem in such a realistic way! You are truly brilliant. Thank you so much! I just discovered your website today on the app flipboard. I am so excited to read your articles because each one resonates with me. I have 4 children and a full time career. My husband does not understand why I “know” how to lose weight but I always sabotage myself by bingeing on food. I actually hide the food I eat from him and others because I know they will be disappointed in me. I really enjoyed reading your article about the single woman but I am having trouble seeing how I can focus on my needs and me when I don’t have time to do anything for me. I’m super busy with everything in my life and I’d love to hear an example someone who has a similar home situation to mine. Thanks! I look forward to reading more! Amazing website! This post was amazing! I have been lacking in being able to add more fun to my weeks and life. I didn’t know how to start. Thank you so much for this! I have been at home with kids for the last 5 years. I feel like I lost touch with what my self-image used to be before all this madness started… somewhere between planning and preparing different meals for each kid and adult in the house for breakfast, lunch and dinner, I cant stop obsessing over food… once I gave birth to my first born, I went thru counting calories (yeah, it totally worked.. I lost some 25 kg while eating cheesecakes, pies,… no decent food for like a year! ), eating responsibly while being pregnant with my second child (as If that could actually be doable, when you have emotional eating disorder!… it worked for like 3 months before the hormones kicked in…go figure), losing baby weight with a great help of stress (it gets simple to lose weight when you simply stop eating, when you have anxiety disorder as well), adding weight while trying to feel normal yet again (and that happens, when you are slightly depressed and think you can eat like you used to back when you were 20.. only that you no longer live a busy life, and dont do any exercise…), following paleo diet (because nothing feels better than being a part of an online community, right? only, there are no faces, no names… its always just you, you alone, and it feels nothing short of depressing), low carb keto-diet (because once a rational adult, it just makes sense to approach things scientifically… and when you get desperate, you want to try something that sounds radical, right?… sure, it works… but you also end up obsessing over food even more…), and back to paleo (because once you realize that you are being obsessive, you try to take things back to basics… “eat that, dont eat that… dont count anything”…)… I am tired, over educated housewife and I am definitely losing grip! Finally, let me say this: I really enjoyed this post! I never write into blog comments (really.. this is my first ever… even if slightly desperate and depressing one… and yes, I write this at 3 am, because of course, I have insomnia as well!) I m not gona write that my life changed by reading your website, that would be too much of a denial, and if I had a therapist, I m sure she would tell me its really not healthy for me… but once again I get a feeling like I can revisit my approach to food and get a chance on breaking out of the circle, which is about so much more than just bad food choices and anxiety… and that feels good. It feels like, maybe there is still a chance to put once life back in order (it feels like there still is some kind of life to go back to and mend). And no, its not midlife crises talking, its not a fear of getting older and not fulfilling your dreams and ambitions… its a legitimate worry, that you will find yourself at a point, when you are in pieces, broken, unfix-able, and there is no reset button… after reading your post, I feel like I m still not a lost case and there is more to try, before giving up!